Hold on to your helicopters: "Miss Saigon" is coming back to Broadway. "Miss Saigon" has made its Broadway return official. Alain Boublil and Claude-Michel Schönberg’s legendary musical -- which opened at the Broadway Theatre in 1991 starring Lea Salonga and Jonathan Pryce, and closed in 2001 -- will return to the same house in March 2017. Performances begin March 1, with an opening night set for March 23. The limited production is set to close on Jan. 14, 2018, before launching a North American tour beginning in Providence, Rhode Island and continuing through more than 50 cities including Boston, Chicago, and Los Angeles. The revival, directed by Laurence Connor ("School of Rock"), will transfer from London, where it opened to critical acclaim and sold-out crowds in May 2014. 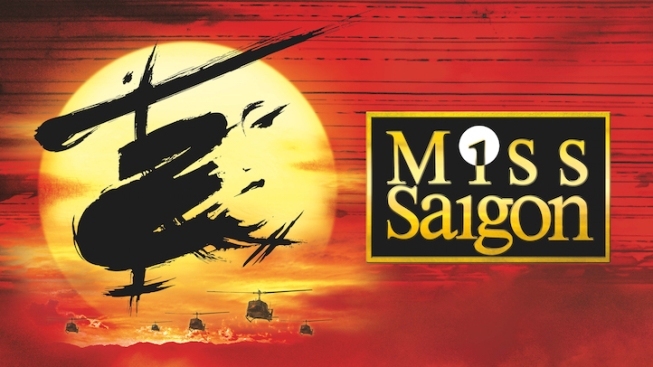 "Of all my shows, 'Miss Saigon' is the one that I have received the most requests from the public to bring back," producer Cameron Mackintosh said, in a statement. "I am thrilled that Broadway audiences will get to see this tremendous new production." Stars Jon Jon Briones and Eva Noblezada -- both American -- will transfer with the production. The show will mark each of their Broadway debuts. Noblezada was discovered three years ago by the "Miss Saigon" casting team at the National High School Musical Theater Awards ("The Jimmys") -- named after legendary theater owner James Nederlander, who died on July 25. "Miss Saigon" tells the story of an orphaned girl who falls in love with an American GI in war-torn Saigon. Music comes from Schönberg with lyrics by Boublil. Richard Maltby Jr. aided in the French adaptation of Boublil’s lyrics, with additional lyrics by Michael Mahle. Mackintosh currently has three other productions running on Broadway: "The Phantom of the Opera," "Les Miserables," and the newly-opened revival of "Cats." For tickets and more information, visit www.saigonbroadway.com.